Caring and sharing: DEFINE founder Henry Richardson with clients. Conveniently located in Al Marsa, the chic, new studio is small but efficient, and even though up and running just a few months – and offering just three signature classes on the entire menu – somehow sessions are already always packed and booking ahead is a must. We had to find out why. So what’s their signature? “We preach balance,” says General Manager Laura Olivier. “I know I’m biased because these are the only three classes I do [as a general workout] but the DEFINE method is perfect for that as it’s designed to provide a full, balanced fitness regimen. We hear more hybrid signatures are on their way – including DEFINE Baby for post-natal women, from November – but we convinced Kara Martin to go all in and try the existing lot which, conveniently, ran back to back one crazy Friday morning… Here’s her review. Maybe you’ve tried Barre, but you haven’t tried it like this. It’s sixty sticky minutes painstakingly curated to whittle and work every major and minor muscle group – including some you didn’t even know were there. The word ‘Body’ in DEFINE Body is key – this is that class that, with consistent turn-up, will get you strengthened and lengthened, see you burn fat and lose inches. There’s been talk that ‘strong is the new skinny’, well this class goes beyond that to give you both, which, let’s agree, we kind of prefer. The warm-up choreography alone got me flustered – DEFINE Body’s myriad segments are short and snappy, which is also good because they are painful. Mirrors all around you will also remind you of that scorching agony and how much more you’re sweating than the obvious regulars. Try not to panic – breath-work goes a long way in a class like this. As does posture and proper alignment (so that’s actually what all the mirrors are about). I’m scaring you but, trust me, you’re not going to be the only person, rookie or regular, taking huffy breaks to towel off and glance around wide-eyed because all levels are taken care of and challenged to their max at their individual ability thanks to a wide variety of props used. The squishy balls, resistance bands, hand weights, straps and more actually can be optional too because as it turns out, a lot of the exercises are bodyweight-related. If you choose to ditch the equipment, you’re still going to get your burn. Then, soon enough you’ll be Gwyneth Paltrow-ing the room like the rest of them. Quaking post-Barre, I was pretty scared to hit those spin bikes next, especially because I noticed that some of the props from the previous room – squishy ball and hand weights – had been placed on top of the bikes, too! Obviously, on this particular day, the idea of also working upper body in a leg-specific class did not excite me, but ultimately, it makes perfect sense. If you’re a Spin addict or cyclist, this is the perfect opportunity to receive full-body benefits on your favourite piece of equipment. While rolling deep to some epic, bass-heavy tracks, we were also rocking back and forth up top doing mini push-ups on our handlebars with the aid of some bouncy resistance from the squishy ball, as well as other bicep and tricep burners with the dumbbells. Intense bursts of sitting, standing and leaning from side to side as we rode like the wind is why this class will literally take the wind out of you, too. It’s pretty choreography-based so prepare to dance on a bike, basically. This is the perfect counter-activity for all the previous crazy. If you ever attempt “the trifecta” (maybe don’t), then book this last. It’s yoga, but with the assistance of suspended hammocks and handles which make it perfect for anyone looking to increase range of motion, enhance stretches and/or relieve chronic pain, while trying something creative and cool. We had a lot of fibres and feelings to stretch out that day so there was much more groaning and sweating than you will probably usually hear in DEFINE Mind. But there was also laughter as we were given some fun and explorative time to do things like hang bat-like upside down in extended inversions, as well as swing in the hammock while doing asana in the least traditional way possible. Needless to say, bored yogis should also sign up. Meditation and breathing are also accounted for, and where this Aerial class goes the extra mile is by introducing a firm ball to sore muscles. We spent a solid quarter portion of the class rolling out knots and other tight, worrying feels from feet all the way up to neck, and it was glorious. “The Mind ball, which is also for sale here, is great. Not only does it lengthen the muscles but it also breaks down lactic acid (meaning you’ll be less sore from any previous classes),” commented Olivier, who did the class with me. My “triple threat” experience actually finished just in time for the cheeky idea of possibly settling into brunch a short walk away at one of the fabulous Pier 7 venues, but it also left me feeling so accomplished and healthy that I just opted for a huge helping of some clean bottled creation they stock in the fridge instead (courtesy lovely local brand Kold Press Juice Kompany), followed by an easy Friday… and a well-deserved raucous Saturday. Needless to say, if you want to work hard and play hard, DEFINE’s got you covered. Head to Urban Yoga this Friday. Many of us find it tricky to let go of our day, especially given the fast-paced nature of life in Dubai. Often, we use distractions to fool our body into ‘relaxing’ before we eventually make our way to bed – typically after spending time looking at a phone! This can result in restless, broken sleep and perhaps even waking in the middle of the night to start processing things we could have let go of before sleep. By learning a simple routine, you can help to create the perfect environment to slip gently into a deep, more fulfilling rest. Join Amanda & Edita on Friday October 21, between 3.00-5.30pm, at Urban Yoga for a Yin-Yang Yoga Masterclass! 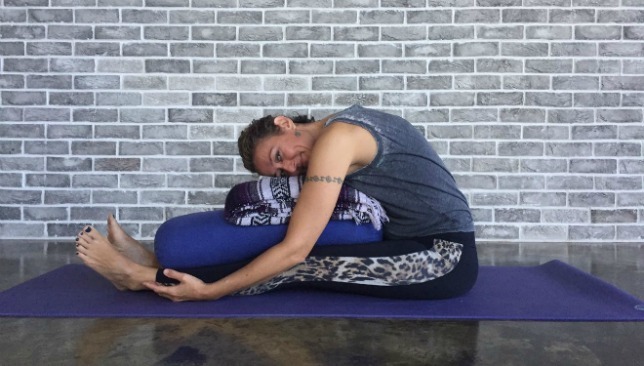 This class will tie together an active, sweaty yoga practice where you feel physically challenged with a restorative Yin Yoga practice to find the sweetness of surrender into deep stretch and restore postures. Full details are available at www.urbanyoga.ae and on Facebook. The following 3 Yin Yoga postures alongside some mindfulness can help in releasing and preparing body and mind for the night time. Lay on your back. Heel-walk your legs over to the right side, maintaining even hips on the mat. Option here to hook left foot over right. Take your arms above your head, shift the upper body over to the right side, maintaining even shoulders on the mat. Link your thumbs. Put your head in any position that is comfortable. This pose can help with making decisions and letting go. Avoid: forcing parts of your body to release, focus instead on releasing into the pose. Stay for 4 mins each side. Sit on a blanket, legs straight in front of you. Fold yourself over your thighs and prop as necessary to feel a stretch, but no strain. If you have tightness in the hamstrings or lower back, bend your knees and place a bolster, block or cushion underneath. This pose starts the unwinding process, using the calmness of a forward fold. Avoid: bouncing in the pose, instead try to breathe through any tension you feel. Stay for 4 mins. Kneel on your mat, fold over your thighs, reach the arms out in front. Place your forehead on a block or cushion – and then try to melt towards the ground. This pose allows us to go inwards, avoiding external distractions. Avoid: if you have just eaten. Stay for 4 mins. Four best places to run in Dubai for free! What sport is on this week in the UAE? 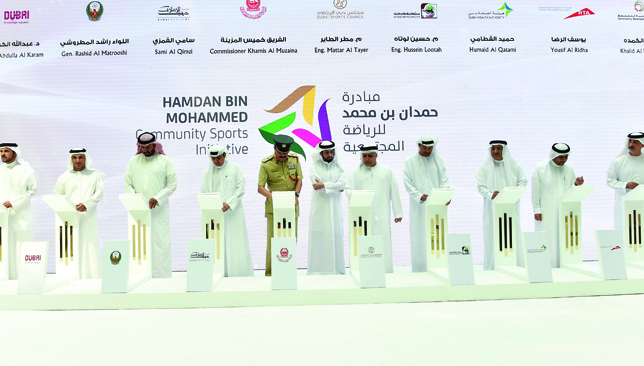 The Sheikh Hamdan Bin Mohammed Community Sports Initiative, launched recently by Dubai Sports Council, is a unique effort to get people to participate in more sporting activities and enjoy the various benefits of doing so. 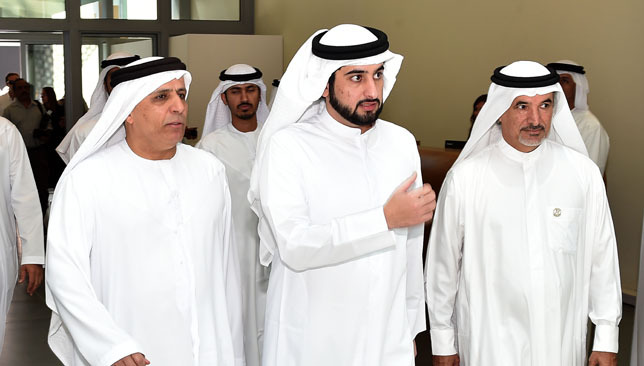 The initiative is the direct result of the ‘Sport Innovation Laboratory’, a first-of-its-kind discussion organised by Dubai Sports Council under the patronage of Sheikh Hamdan in May this year. 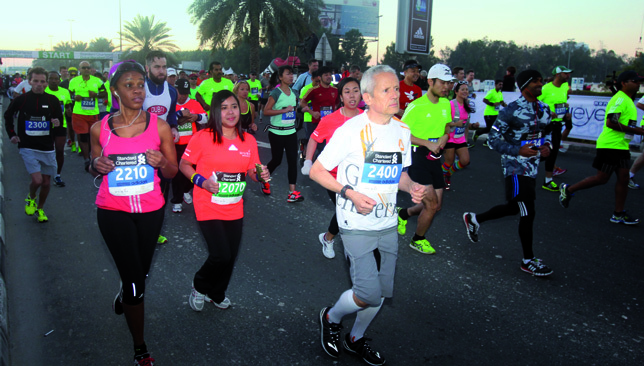 It was one of the eight recommendations approved by the Crown Prince, who is also Chairman of the Council, after months of discussions with various stakeholders aimed at raising sporting awareness among the UAE’s residents. 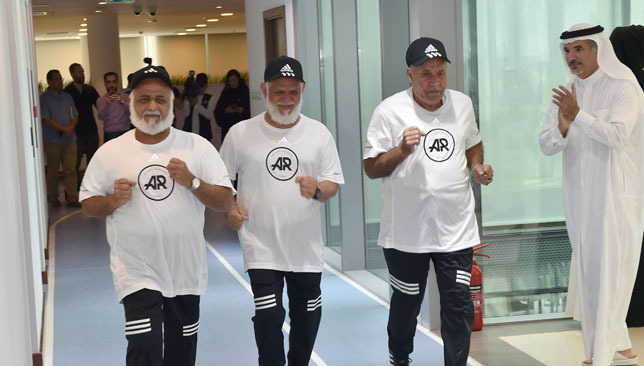 In a message, Sheikh Hamdan said: “Physical activity is one of the basic necessities to stay healthy and happy, as well as keeping the people around us happy. “A healthy individual is one who is capable of working hard and giving their all, thus fulfilling their role as an active member in the society in the best way possible. He or she is someone who is capable of achieving great things which would therefore make them part of building the future of our country. “Which is why sport and physical fitness is receiving attention and care from our wise leadership and has been included in the government’s work curriculum. The Sheikh Hamdan Bin Mohammed Community Sports Initiative is based on six pillars – each of which will be added to the overall programme as part of a planned timeline. Three components of the Initiative will begin this year – strategic partnerships with various governments and private entities; the launch of community sport activities with special focus on swimming, cycling and running, and seeking co-operation from private clubs, making use of their quality facilities and know-how. Next year, Dubai Sports Council will launch a smartphone App which will help it communicate better with the residents and get to know the specific sporting needs of the various communities. The App will also encourage people to take part in activities and events, and will encourage them to organise their own games. Also planned for 2017 is the Dubai Fitness Bus, which will be equipped with fitness machines and experts, and will travel to various parts of the city, thus giving residents a chance to indulge in physical activities closer to their homes. And, in 2018, Dubai will roll out the Dubai Fitness Index, which will become the most important method to measure how sport is played in the society and how it needs to be developed. The Index was developed by the University of Alaska for Sport Science after years of research and is approved by the United Nations Office on Sport for Development and Peace (UNOSDP). Dubai will become the first non-American city to implement this project. The Index will collect information and identify accurate indicators which will then be scientifically analysed to figure out the lifestyle planned for residents, with special focus on sporting facilities. Dubai will be divided into nine areas, and the data provided by the Index about each of these areas will help in planning events better and increasing the number of activities currently organised at the public parks, open beaches, tracks, private clubs and commercial centres. Another interesting aspect of the Initiative are the appointments of ‘Knights’, or ambassadors, who will help spread the word and encourage more people to take up sports. Among the knights are coach of the UAE national football team, Mahdi Ali, multiple Paralympics gold medalist Mohammed Khamis, former UAE football star Mohammed Al Kous, current star Ahmed Khalil and CrossFit expert Amna Haddad. During the official launch of the Initiative, conducted by HH Sheikh Ahmed bin Mohammed bin Rashid Al Maktoum, Chairman of the Mohammed bin Rashid Al Maktoum Foundation, and President of UAE National Olympic Committee, directors of 10 participating government entities signed the agreement to be a part of the programme. Speaking at the launch programme, Mattar Al Tayer, vicechairman of Dubai Sports Council, said: “We have succeeded in the recent period in raising the percentage of people who regularly take part in physical activities in the emirate of Dubai from 34 per cent to more than 43 per cent through the Dubai Pulse programme.